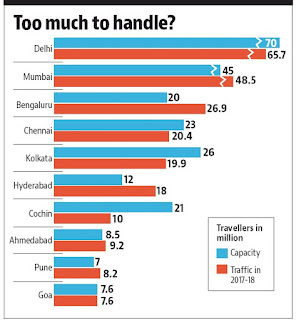 At least 25 of the 50 busiest airports in India are already operating beyond their capacity, while almost all the others will reach optimal capacity in 2018-19, with the aviation industry growing at an unanticipated 18-20% every year. This holds true for both government and privately-run airports. 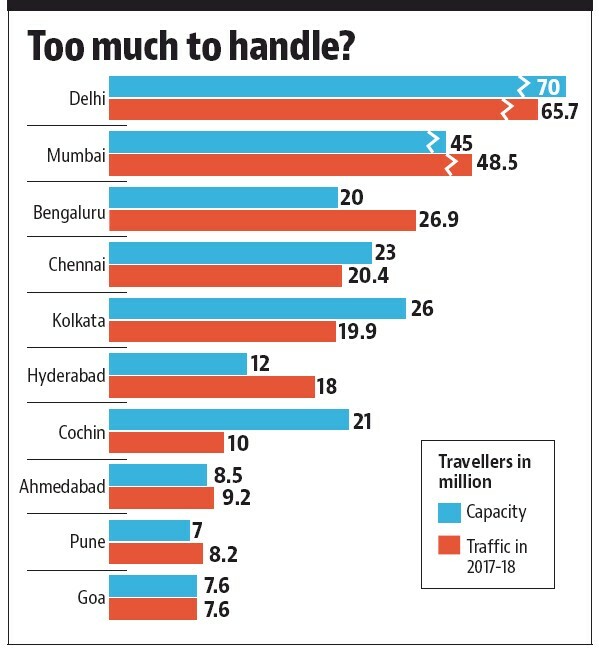 Key airports such as Mumbai, Bengaluru, Hyderabad, Ahmedabad and Pune are already saturated, while Delhi, Kolkata, Chennai, Goa and Lucknow are among important aviation hubs that will reach full capacity by the end of the year. Experts say the figures only show overall capacity, but in peak hours, all these airports operate beyond capacity — leading to long queues at check-in counters, security risks because of compromised frisking, and clogging of gates leading to flight delays. According to the civil aviation ministry, India has witnessed a phenomenal growth — the highest in the world — in the sector in the past four years and is already the world’s third-largest domestic aviation market. Smaller airports such as Leh, Surat, Tirupati, Jodhpur and Silchar are also operating beyond capacity.